Las Vegas Business Academy, a nonprofit dedicated to providing scholarships and mentorship opportunities to a select group of students seeking master’s degrees in business, hospitality or law at UNLV, celebrated its sixth anniversary May 10 at Twist by Pierre Gagnaire inside Mandarin Oriental. Four of the city’s finest young minds, Steven Brody, Caitlin Lorelli, Michael Matzke and Mackenzie Warren, each of whom has committed to remaining in Las Vegas for at least five years following graduation, received “Jedi Master” Awards from Amy Lee, LVBA executive director. Matzke, Warren and Lorelli will all receive their Juris doctorates later this month, while Brody will graduate with a master of business administration. Rino Armeni, LVBA founder and chairman of the board, presented Josh “Chop” Towbin, owner of Towbin Motorcars, with the Mastership Award, which is given to business leaders who are pillars of the local community and have committed to mentoring the next generation of Las Vegas-based entrepreneurs. Towbin accepted the award alongside his son and spoke about his professional journey and the importance of being brave and unafraid to take risks. 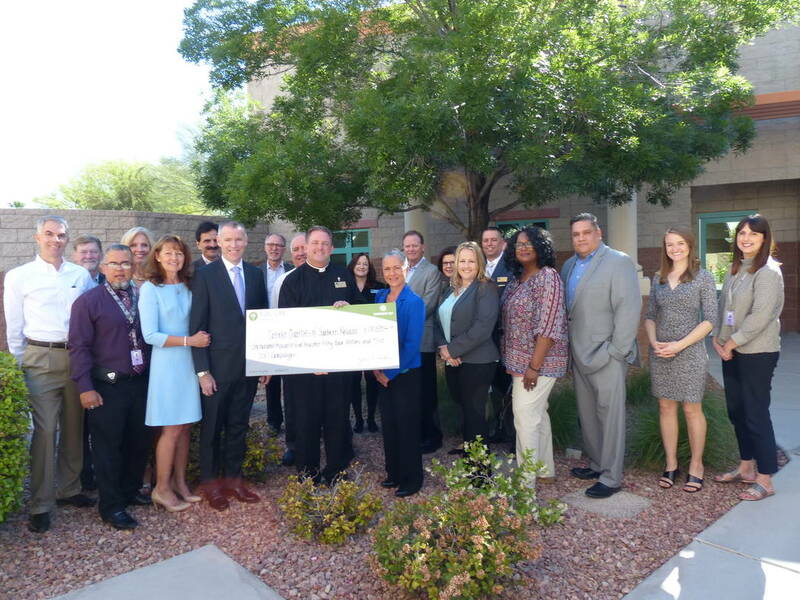 Southwest Gas presented a check for $100,554 to Catholic Charities of Southern Nevada as part of its 2017 Fuel For Life Campaign, which provides direct financial support to area nonprofits. The funds, raised by Southwest Gas employees, will help CCSN’s suite of 20 programs, including Meals on Wheels, Hands of Hope Community Food Pantry and both day and evening shelters. After-School All-Stars Las Vegas unveiled its new office May 10, celebrating the first anniversary of the nonprofit’s partnership with Ikea. Clark County Commissioner Steve Sisolak joined fellow commissioners and ASAS board members Chris Giunchigliani and Lawrence Weekly at the special ceremony featuring ASAS student performers and Amy Jensen, store manager of Ikea Las Vegas. One year ago, students, staff and volunteers from ASAS proudly stood on stage at the Ilea grand opening to announce the partnership between the local nonprofit that serves more than 6,500 at-risk youth in 15 Clark County elementary and middle schools and the worldwide home furnishings retailer. In the 12 months since, ASAS hired a new executive director, brought ASAS programming to two additional Clark County school sites and moved into a new office. After a valleywide search, the organization found its ideal office location near the corner of Durango Drive and Sunset Road across the street from Ikea. The Shriners Hospitals for Children Open has appointed the executive committee members chosen to oversee the 2017 tournament, taking place Oct. 30-Nov. 5 at TPC Summerlin. The executive board is made up of professionals from the Las Vegas Valley who are committed to creating the best possible experience for fans and supporters of the Shriners Hospitals for Children Open. The board also strives to support and promote the mission of the Shriners Hospitals for Children to provide specialty care for children regardless of a family’s ability to pay. The Shriners Hospitals for Children Open 2017 Executive Board members are Mark Fine, Mark L. Fine and Associates (co-chairman); Allan Creel, Creel Printing (co-chairman); Elizabeth Blau, Blau and Associates; Tom Breitling, Breitling Ventures; Mike Flanagan, Propel Marketing; Dallas Haun, Nevada State Bank; Brian Hawthorne, Full Swing Golf; Kevin Hooks, The Virtuous Group; Emily Jillette, local philanthropist; Tom Jingoli, Konami Gaming; Greg Lee, Eureka Casino; John McGraw, Equestrian Life; Curtis Myles, CEO, Las Vegas Monorail; Bryan O’Reilly, Topgolf Las Vegas; Patrick Ramsey, BOD Aristocrat Technologies; Tony Renaud, Discovery Land Company/The Summit; Don Snyder, former UNLV president; and Terry Wright, Nevada Title. 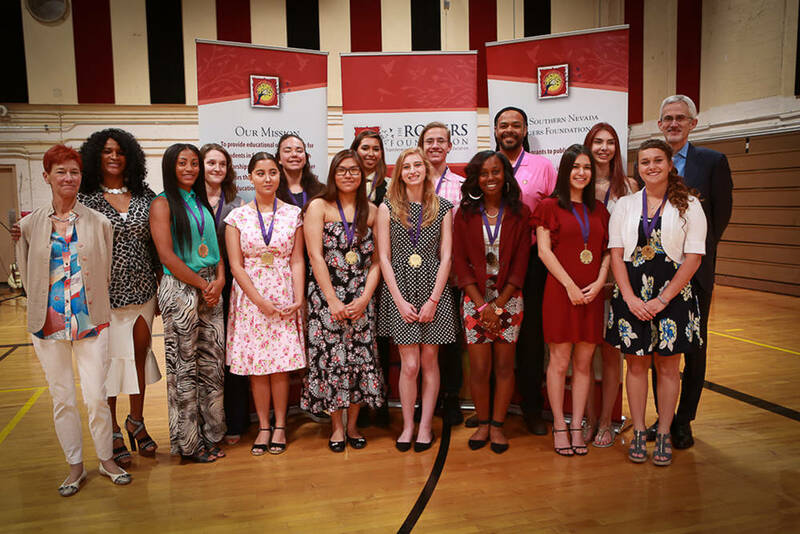 The Rogers Foundation held a private reception and ceremony at Las Vegas Academy of the Performing Arts on April 29 to award 28 Clark County School District high school seniors with more than $2 million in college scholarships. After reading through hundreds of applications, The Rogers Foundation narrowed the pool down and called dozens of students in for interviews. After committee discussions, 28 students were selected. Kentucky Wesleyan Rogers’ Fellows: Fourteen Rogers’ Fellows scholarships were awarded. Recipients will have all college expenses paid for at Kentucky Wesleyan College, an institution close to The Rogers Foundation and the alma mater of many in the Rogers family. Over the next 10 years, The Rogers Foundation will provide $10 million in total to cultivate a community of Southern Nevada scholars at Kentucky Wesleyan College. The Rogers Foundation Achievers: Fourteen Rogers’ Achievers scholarships were awarded. Recipients have the opportunity to use their scholarships at any college or university in the country. Eight students received $5,000 scholarships, five received $10,000 scholarships and one received a $25,000 scholarship. The scholarships renew every year for four years. The Rogers Foundation plans to continue awarding college scholarships every year. 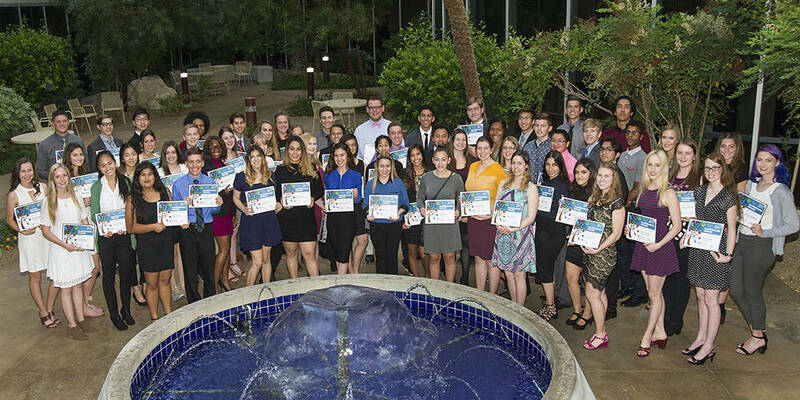 The NV Energy Foundation has awarded $94,000 in scholarships to Southern Nevada high school seniors representing 47 high schools. The amount includes 90 Powerful Partnership scholarships of $1,000 each and two NV Energy Dependent Scholarships of $2,000 each. The one-time scholarships can be used at any accredited university, college or trade school and were awarded based on academic achievement, community service and volunteerism. The Powerful Partnership Scholarship program was established in 2000 to support the attainment of higher education for Nevada students and to reward area high school seniors who have shown a commitment to the community. Since then, NV Energy has given more than $900,000 in scholarships to Southern Nevada students and nearly $1.7 million statewide. The scholarship program is administered by the Public Education Foundation. Brady, a janitorial supply, equipment and food service distributor, announced its new charitable giving campaign, “Brady Shines,” as part of its 70th anniversary celebration. On April 26, president and CEO Travis Brady awarded the first donation to Sunrise Mountain High School. Accepting on its behalf was Principal Julia Llapur. Sunrise Mountain High School will use the $20,000 donation to support its Aviation and Robotics Clubs, as well as the after-school bus program. An internal committee at Brady is being formed to review future donation opportunities while a formal application process is in development to launch in summer 2017. 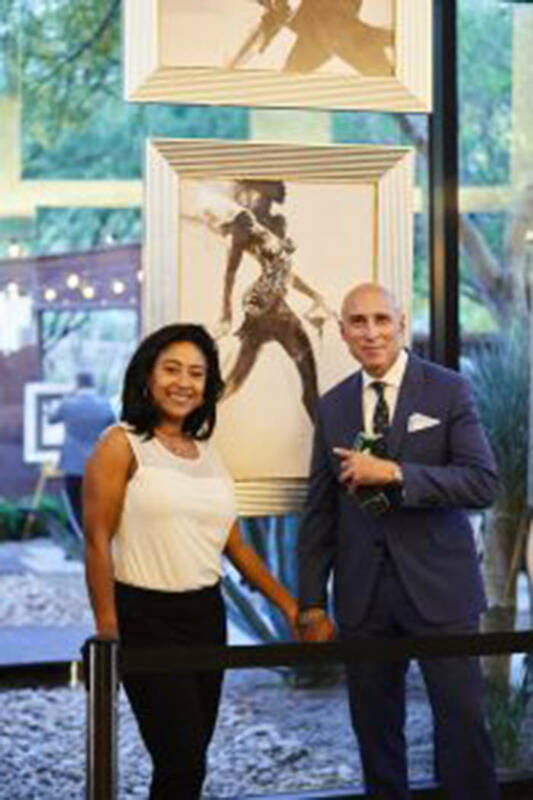 Entertainment advertising agency owner and artist Alan Hunter raised $35,000 for the Nevada Partnership for Homeless Youth on the first night of his public art exhibition at ASCAYA. Hunter’s Petrol Advertising is one of the industry’s leading agencies and the creative team behind promoting iconic American brands such as Seagate, AMD, UFC, Activision’s Destiny and Call of Duty. Hunter’s combination of alcohol and ink makes for elegant paintings inspired by his travels around the world. One of his favorite sources of inspiration is Las Vegas, where he often walks through casinos and the Las Vegas Strip late at night and sees everyday people transforming into extraordinary personalities. Hunter said he was drawn to ASCAYA as a location for not only his art showcase, but also a future icon of the city he loves so much and has so many deep crossovers in business. 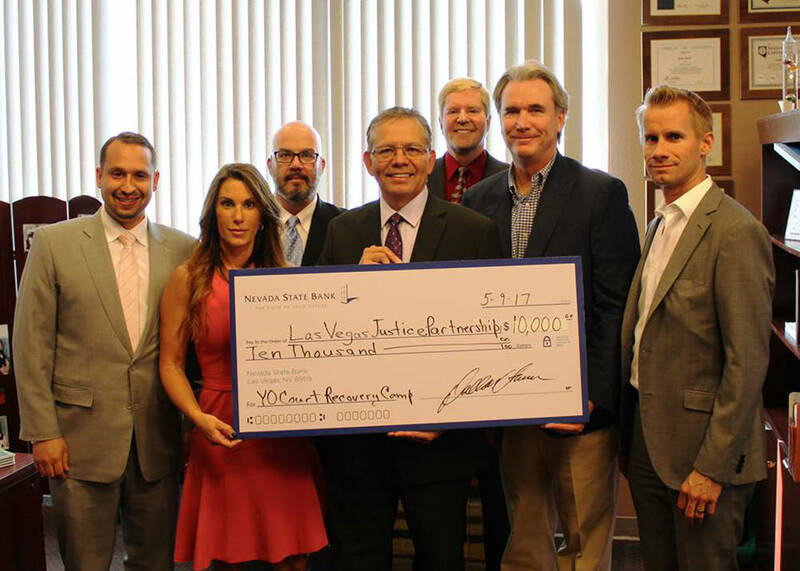 Nevada State Bank has made a $10,000 donation to the Las Vegas Justice Partnership to benefit the Youth Offender Court. This is the first donation to the newly formed organization. The funds will assist in providing treatment and resources to youth offenders who need a second chance. Southwest Gas Vice President-Regulation and Public Affairs Justin Brown, along with other members of the Southwest Gas team, joined Nevada Partnership for Homeless Youth representatives and youth clients at the nonprofit’s Drop-In Center to present a donation of more than $50,000 to support the organization’s continued battle against youth homelessness. The check represents money raised during Southwest Gas’s 2016/2017 Fuel for Life campaign, which came from many different employees donating from each paycheck. The donation will go toward NPHY programs that help stabilize the lives of homeless youth and get them onto a pathway of self-sufficiency. These direct services for homeless youth include outreach, emergency shelter, the Safe Place Mobile Crisis Intervention Program, the Independent Living Program, Operation Go Home family reunification, and Drop-In Center services such as food, hygiene supplies, identification and birth certificates, bus passes, employment and education assistance, case management from licensed social workers, counseling, legal aid and more. Western Governors University Nevada celebrated its second commencement by honoring nearly 400 graduates from around the state on May 20 at The Smith Center. With a diverse student population, the online, nonprofit university is turning out graduates to meet the higher demand of skilled workforce jobs in the Silver State. U.S. Rep. Ruben Kihuen, D-Nev., gave the commencement address. Of the nearly 400 graduates who were honored, 132 are from the College of Business, 113 are from the College of Health Professions, 112 are from the Teacher’s College, and 38 are from the College of Information Technology. For the third year, the results from a recent Gallup study, comparing the satisfaction and well-being of WGU graduates with graduates from other institutions, demonstrate that WGU graduates are more likely to have the jobs they want, feel engaged at work and have an emotional attachment to the university. Las Vegas Sands and Grammy-nominated artist Jewel joined forces May 19 at Inspire, a charity concert event presented by Sands Cares, the charitable giving program of Las Vegas Sands. Proceeds from the gala went to support the Marty Hennessy Inspiring Children Foundation in its mission to take at-risk youth off the streets and into greatness by providing them with life-changing opportunities. The event at Palazzo featured a red carpet entry into the Palazzo Theatre and was capped by a concert from Jewel, showcasing her messages to the young people of the foundation. The Marty Hennessy Inspiring Children Foundation has been named the first member of Las Vegas Sands’ Sands Cares Accelerator Program, which entrenches deeper investment in growing nonprofit organizations that have the potential to more greatly impact the local community with the gift of additional resources from a major corporate partner. Southern Nevada community members were invited to visit select McDonald’s restaurants during National Police Week, May 15-19, for a fundraising event benefiting the Injured Police Officers Fund. A portion of the proceeds from all McCafe beverage purchases will help provide financial assistance for officers and their families in times of need. Select McDonald’s restaurants hosted personnel from multiple police jurisdictions, including the Metropolitan Police Department, the Nevada Highway Patrol, the Henderson Police Department and the North Las Vegas Police Department, who volunteered their time to greet customers and address community concerns while raising donations and awareness for the fund.